Foreword : I recognize this post is a little more lengthy than usual. I hope this will not deter you from reading, as within its text I attempt to connect the Shakers to Robert Stack, denture adhesives, barnyard appetites and home improvements. Quite the feat, if I do say so myself. 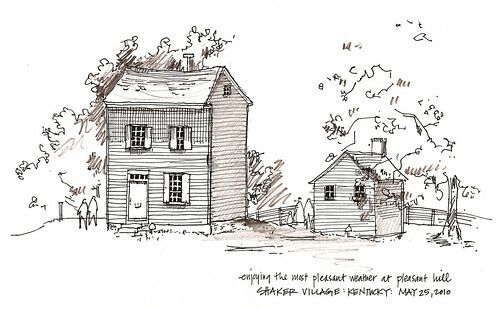 The first of the recent road trips led to the Shaker Village of Pleasant Hill, Kentucky. This has long been one of my sister's favorite destinations and, having now experienced it for myself, I can understand its gravitational pull. If you're in need of a place to go, think, and be in peace...this is it. Quiet, simple, pristine, perfect: just the way the Shakers wanted it. 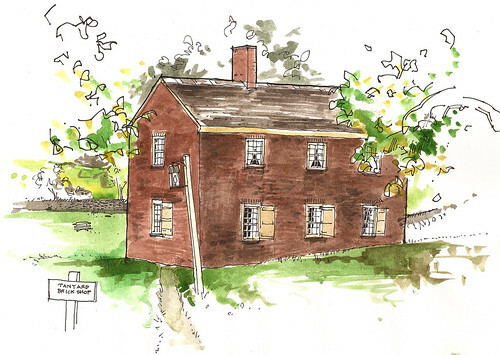 While at Pleasant Hill we stayed in a little house dating back to the early 1800s. According to the many diaries found in the cottage, it is haunted by a ghost named Sister Polly. I'd like to pretend this didn't give me the jitters, but too many episodes of Unsolved Mysteries have left me a scaredy cat. I could almost hear Robert Stack's voiceover as I moved through the house. Luckily, Polly did not make an appearance during our trip, though she did lead to a fun game my mom and I like to play where we name everyone we can think of with the same first name. It started out serious, but eventually led to Polly Pocket, Polly Graph, Polly Ester...and days later Polly Grip and Polly Eurathane. Do you know any Pollys? If I had to name one thing that struck me the most about Kentucky as a whole, it was the beautiful green fields and the constrasting black barns. They are breathtaking. For quite a while now Edgar and I have contemplated painted our house, currently a timid pale gray, a more gutsy black. 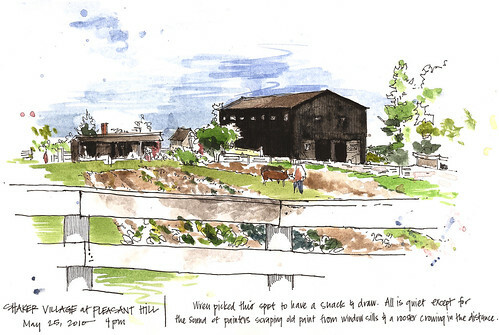 Seeing how beautiful these barns are on the landscape has given me the push to go for it! In retrospect, this was the most restful of trips: one I would highly recommend to anyone who needs an escape from the daily grind, cell phones, and, heaven forbid, blogs! I know I repeat myself but I love your drawings. 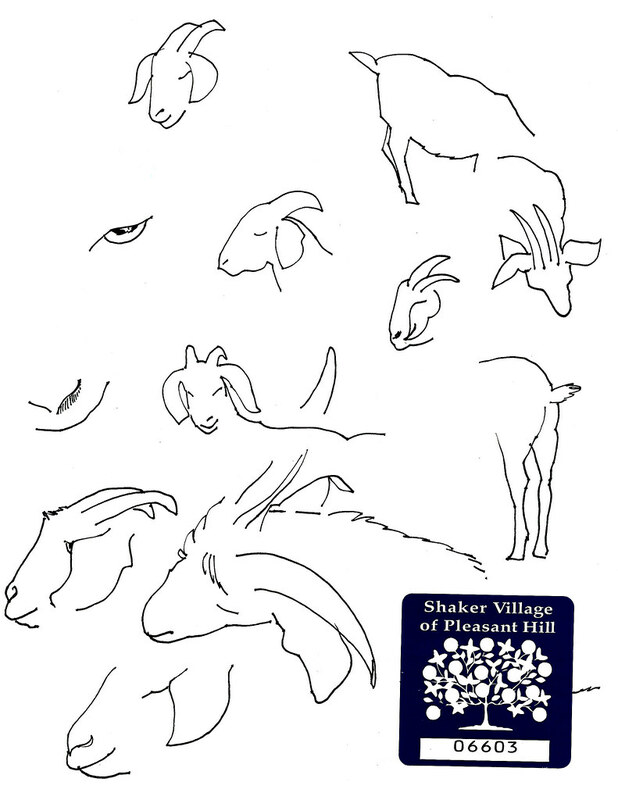 Especially the goat sketches are cool. Just a few lines and I know it's a goat feeding on gras. Amazing. I really love this post! makes me wanna pack my bags and go and live with the goats! I've been there, too, and I found it just as peaceful and beautiful as you did. Gorgeous! I love those black barns in Kentucky - I still remember seeing them for the first time, over 20 years ago, and thinking they were perfect, set among the rolling green hills. Thanks for reading...and the terrific Polly entries. Love it. As a kid, I loved creosoted(black) houses, especially if their window sashes were bright fire-engine red. Double-special if they had hollyhocks at the door! I'm surprised you don't already have a goat! i thoroughly enjoyed this post and can imagine you writing a book along the lines of sara midda and laura stoddart. i'd buy it in a heartbeat. enjoy your weekend! Thank you so much Cindy. You couldn't pay me a higher compliment! Truly. I love reading through your blog. I especially like this post! You're so talented and it was fun watching you create! I love your traveling moleskin with Gabi. --- From your new friend Polly from Kentucky!